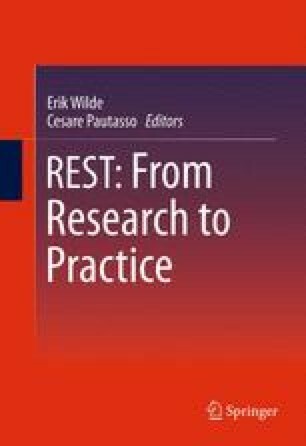 REST was originally developed as the architectural foundation for the human-oriented Web, but it has turned out to be a useful architectural style for machine-to-machine distributed systems as well. The most prominent wave of machine-oriented RESTful systems are Web APIs (also known as RESTful services), provided by Web sites such as Facebook, Flickr, and Amazon to facilitate access to the services from programmatic clients, including other Web sites. Currently, Web APIs do not commonly provide machine-processable service descriptions which would help tool support and even some degree of automation on the client side. This chapter presents current research on lightweight service description for Web APIs, building on the HTML documentation that accompanies the APIs. descriptions. HTML documentation can be annotated with a microformat that captures a minimal machine-oriented service model, or with RDFa using the RDF representation of the same service model. Machine-oriented descriptions (now embedded in the HTML documentation of Web APIs) can also capture the semantics of Web APIs and thus support further automation for clients. The chapter includes a discussion of various types and degrees of tool support and automation possible using the lightweight service descriptions. The authors would like to thank Dr. Karthik Gomadam for collaboration on the hRESTS microformat. Much of the work presented in this chapter has been supported by the European Union research project SOA4All http://www.soa4all.eu.